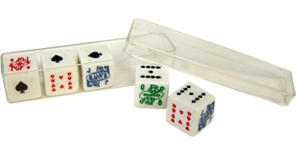 These Classic Poker Dice have representations of playing cards on the Dice. 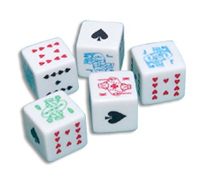 Each side of the Dice has an Ace, King, Queen, Jack, ten, or nine, which are used to form a Poker Hand. Our 16 mm Wholesale/Bulk Poker Dice Sets are available bulk-packed or individually boxed in clear plastic Dice Boxes. While the game of poker dice has many variations, the standard one does not recognize straights and has hand values of five of a kind, four of a kind, full house, three of a kind, two pairs, and one pair. In games in which straight hands are permitted, the ace may be played at either end (i.e., below the two or above the six). Generally played according to Draw Poker rules, in the game of Poker Dice, players may only discard a maximum of three dice. Each player has up to three rolls to construct the best hand he can. Betting is typically for coins or dollars as well as drinks.